This time Daner and Steven talk about finally getting the new Code Red blu-ray of Messiah of Evil and watch Scream for Help, the new film Wyrmwood, and Dana watches some Death Wish movies alone. Its crazier than Bill Olson could even be! CK and Uncle Bill are officially snowed in for what could possibly be the first of many days in what is one of the worst snow storms East Kentucky has seen in decades. However, with severe boredom brings joy to the DEADPIT faithful as the dastardly duo decided to do a SNOWED IN SPECIAL. 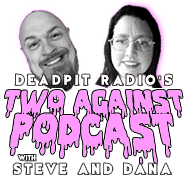 Many fun topics including: Fifty Shades of Grey, SNL 40, Kentucky Basketball, CK's engagement and all the latest horror talk this week on a special MONDAY edition of DEADPIT Radio!! DEADPIT is back this week, this time with CK and B-Plan as they talk about all things horror, including the latest from Scream Factory, Updated news on remakes of Halloween, Martyers and Poltergeist! Plus CK selling off his beloved laserdisc collection! 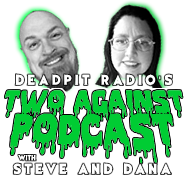 All that and not much about Jason Voorhees, on EVERYONE's favorite horror show...DEADPIT Radio!! This time A group of teenagers spends the night in a furniture store for a graduation party. A psycho killer starts to hunt them down and kill them off. One of the strangest slasher villains ever! get some beer and fried chicken!